Brazil v Belgium Betting Tips: Selecao To Beat Red Devils? Bet on Brazil Victory at 11/10 with 888sport. Bet on Under 2.5 Goals with Paddy Power at 41/50. Bet on Neymar to Score First at 4/1 with Bet365. Having looked on as their usual rivals have all been eliminated one by one, Brazil will head into their quarter final knowing they will never have a better chance to add to their haul of five World Cup wins. No other nation has lifted the trophy as often as the Selecao, and with Argentina, Spain, Germany and Portugal already sent packing, the list of contenders has shrunken enough for Tite’s men to begin to dream. "We're all soldiers of our Brazil,” defender Marquinhos told reporters this week. “It's important to bring joy to the people back in Brazil, and our fans here in Russia as well." Hoping to prevent them from doing so is a talent-laden Belgium squad, a side littered with star names but one which has yet to truly click into gear under Roberto Martinez. Brazil have not lost since facing Argentina last August, conceding just one goal in their last nine matches while winning eight of those games. The only blemish on that record is a 1-1 draw with Switzerland, since which they have won three consecutive outings by a 2-0 scoreline, beating Costa Rica, Serbia and Mexico at this tournament. Meanwhile, Belgium’s unbeaten run stretches back to August 2016, and they have won each of their last six games while scoring an impressive 19 goals in the process. However, their record against CONMEBOL opposition in the knockout rounds of the World Cup is not good as not only have they not won any of their games against South American teams, they have done so while failing to net a single goal! The only previous meeting between the two came in a Round of 16 match at Korea/Japan 2002, a game that saw Brazil survive some first-half scares before prevailing through two well-taken goals from Rivaldo in the second period. Brazil are therefore the most likely winners, a victory for the Selecao available at 11/10 with 888sport. However, to make that more enticing, it is perhaps worth looking at the defensive prowess displayed by Tite’s men, and it may also be worth considering having a bet on under 2.5 goals which is available at 41/50 with the same bookmaker. Nobody has been impressed with the antics of Neymar so far in Russia, his playacting and theatrics already panned in numerous columns elsewhere. However, as frustrating as the Paris Saint-Germain forward might be, he has helped his side progress, his goal against Mexico the 57th of his international career in 89 appearances. Always proactive and dangerous, he has also recorded 37 assists in those games, with his haul now including five goals and two assists in just eight World Cup outings. It would be foolish to not expect that to continue here, making Bet365’s offer of 4/1 for him to score first very tempting, as is the same bookmakers odds of 13/10 on Neymar finding the back of the net at any time. 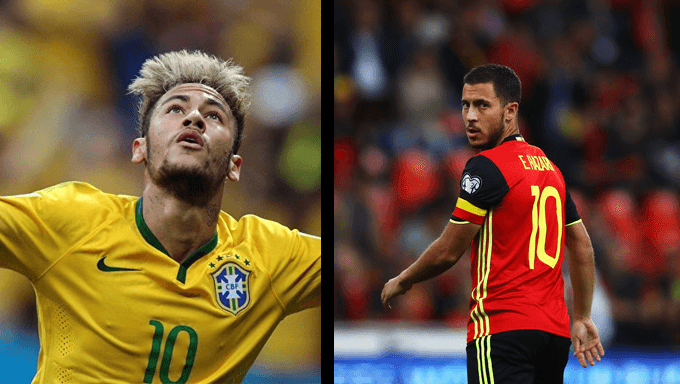 While Neymar’s reputation means he needs no introduction, there are no shortage of star names for Belgium either, with Eden Hazard arguably foremost among them. The Chelsea playmaker boasts an impressive record of his own too, directly involved in 19 goals in his 18 appearances since Martinez too charge. With Danilo struggling for fitness at right-back and likely to be replaced by Fagner, Brazil’s issues have been further compounded by Casemiro’s booking against Mexico. That was his second, meaning he will be suspended here and his ability to cover out wide might well lead to spaces for Belgium to exploit. Nobody is better suited to doing just that than Hazard, and – available at 15/2 with Bet365 – he is perhaps a superb alternative to Neymar in the first goal scorer stakes, but his odds of 13/5 to net at any time are certainly tempting for football betting enthusiasts considering a wager for this game.